I love Thursday nights! It's my favorite night of the week. The day before Friday, lots of TV - we usually have a little TV date night! Tonight I'm cooking steaks and we are going to just relax! I'm so excited! I have so much going on in my head.............we are leaving Monday morning for El Salvador and I'm so excited! It is going to be an amazing trip and I will be blogging daily and I want to share with you and make you feel like you are right there with me! If possible - I plan to twitter also so if you want to follow me - my user name is kellyskorner. (Real imaginative, huh?) Please pray for our trip! I'll give you more detailed prayer requests on Sunday. I have so much to get ready before we leave - yikes! I have to get busy. There is a little boy named Noah is who probably not going to live until Christmas - he has cancer. His family is celebrating Christmas this week with him and he has requested that people send him Christmas Cards. We can all do that, huh? So go HERE and read more about it and if you have an extra card maybe from last year - send it. Let's FLOOD their mail box and make that little boy happy! There is also a 13 year old girl name Lauren Smith who also was told she would not live until Christmas - she has bone cancer. They have a site set up for her with all kinds of things you can do for - fundraisers for her family or just prayer sites. Go visit and see if you can encourage or help. Pray for a miracle above all else. I wrote recently about a young mother, Danielle Cripe, who was told she would not live until the end of the year and who has two children - one with special needs. There is an update you can read HERE. They still need our prayers and support if you would go visit them and share with others. One more thing - the prayer blog for women waiting on husbands and children has been up for right around a year. I just looked and there have been 132 praises of pregnancies and adoptions (that includes 4 that I know about that aren't posted yet) and 12 of those are TWINS! Can we just praise God for answered prayers tonight? I know I feel encouraged when I look at that list of praises - don't you? Did you ever post a picture of Harper's Blessing Ring after you put the cards on it? I couldn't find it and would love to see a picture of it. thanks and good luck w/ your trip. Kelly - Praying for you and Scott as you prepare to leave on your trip! I just posted Paula Deen's Wild Rice and Shrimp casserole on my blog because I made it tonight and it was yummy! I did link back to your blog for anyone who reads mine and wants to know where I found the recipe from as well! Hope you don't mind! OMG - I am so excited to see her wearing the bow! And I can't believe how perfectly it matches!!! I will certainly send cards to the families you mentioned. That is now at the top of my "To Do" list for tomorrow! Glad that y'all are feeling better! Harper's outfit is adorable!! We love Thursday's as well. Enjoy your night. I can't wait to read your posts from El Salvador! I'm already a follower on twitter (CrystalsLife) and will be checking it! Praying for all the families and I'm going to look now for a Christmas card to send! PS: Harper's outfit is SO cute! I love Harper's pillowcase dress! 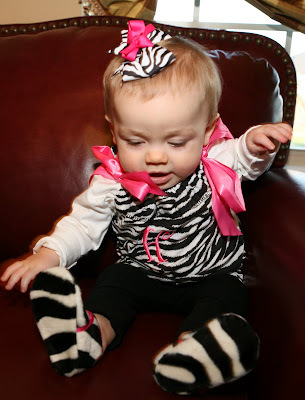 Ya can't go wrong with Zebra print and hot pink! All those families are in my prayers! I am with ya on feeling encouraged when I see the list of praises on your blog too! It puts a smile on my face! God is good! How cool are all those babies! So happy for all those mommies! Good luck with your trip... How long will you be gone? I love that outfit Harper has on! ADORABLE! Kelly I am praying for your trip I hope God teaches you some amazing things, and blesses those around you. Could you pray for me, I just found out I have melanoma cancer they thought it was stage 2 which isn't that bad, but my husband and I went to the surgeon today and now they are having second thoughts and think it is in my blood and possibly other parts of my body. I have a little baby boy who is only 10 weeks old and I am trying to be as positive and hopeful as I can. Thank you!! We LOVE Thursday night TV in our house too!!! And wow...amazing. 132?!?! God is so faithful. I still remember the day I got on that list, and now I sit here today as one of the 12 expecting twins. Kelly you and your praises are AMAZING! Thank you for sharing your life with us and praying. Harper looks just adorable in her little outfit...as always. Good luck on your trip. I will be praying for you. Best of luck on the El Salvador trip! I know it'll be hard being away from Harper! Could you add prayer requests for today's Ft Hood tragedy as well please? It's such a devastating story! Kelly ~ I'm not on facebook, can you post that little boy's address? I would love to send him a card & have my little one's color him a card. Thank you! Praise God for your blog!! kelly, thanks for mentioning noah on this post. as i mentioned before my kids are sending a card and then one from the whole family and also my daughter's girl scout troop is sending one too. have fun on your trip! i bet u will be ready to get home to that sweet little girl of yours! 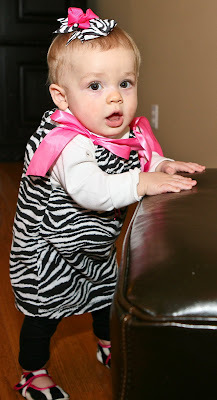 I'm starting to think Harper's favorite color is zebra! haha She looks good in it too! I have been a "lurker" on your blog, but this is the first time that I have commented. Your little Harper is the sweetest little girl!!!! She is so adorable!!! and what a little fashionista!!! I will most definitely add a few more prayers to my list for the families that you have listed. One can never be covered in prayer too much!!! i've already started praying for your trip and for harper being away from you. i know your parents are going to enjoy her so much. Yay for your trip. You will never be the same! Looking forward to sharing it with you. I love Harper's outfit today! Thank you very much for the links, I'll be praying for all of them and sending out that card! I'll look forward to hearing about your trip! I will be praying for a safe trip!!! To anyone who reads this, PLEASE keep all the soldiers and the families at Fort Hood in TX in your prayers. Massive shooting there today, many killed and wounded. They do so much to protect us everyday and it's our chance to support them in prayer, if nothing else. THANK YOU!!! Kelly, Chad and I will be praying for you while you are on your trip! God is going to do great things! I just wrote Noah a card and Im putting in the mail tonight!! God is amazing! I'm grateful for your heart on this matter and what a wonderful way God is showing his many blessings thru your blog! God bless ya girl and I pray you have a safe trip! As you prepare for your trip, just wanted to give you some overseas travel necessities-hand sanitizer and wet wipes! bring twice as many as you think you will need..you will use them, i promise! pepto bismol and immodium are a must, as well as lots of non-smushable snacks...trail mix and granola bars are my fave (cause you never know what you might get served for dinner ha) i think thats it but if you want any more suggestions, email me and id love to chat! (i spend a lot of time out of the country :) Your life will never be the same, and God will reveal Himself to you in a way like never before!! Kelly, I hope you have a wonderful trip. What a marvellous opportunity. We also need to pray for Stellan. He and MckMama are back in Boston--he is scheduled for his 2nd cardiac ablation which likely will kill part of his heart and require him to have a pacemaker for the rest of his life. He's only 1 year old. Thanks! My daughters and I have been lurkers on your blog for many months--ever since I read about Harper's problems after her birth from a P31 devo writer Marybeth Whalen. We cannot be silent anymore since you will be coming to El Salvador next week!! We are so excited to think you will be in our country and we want you to know we will be praying for you, too. We have questions--where will you be staying and what will you be involved in? We keep wondering among us if there could be a way we could meet you??? We don't have Twitter so won't be able to follow your activities once you are here... Be sure we will be checking your blog. God bless you with a great experience! Will you please add me to the praises. We are adopting a baby girl who is due January 10!. God is good!!!! I think you have it under Cawoods. HEy Kelly! Just read this post. Thought you might have some words of encouragement for Jersey Girl and I know tons of prayer! Could you post the address for the little boy? I would love to send him a card. I will be thinking of you and praying for you. Harper is so cute and I just love her outfit! I can't believe your trip is next week! At least you got the flu out of the way and will be on the up and up for your trip! Looking forward to your posts! Yea for Thursday night TV! Even if I don't get to watch all of them until today. Thank goodness for DVR. Getting up at 5:45am just doesn't work with staying up until after 11pm. I can't believe your trip is here already. I will be praying and thinking of you lots. 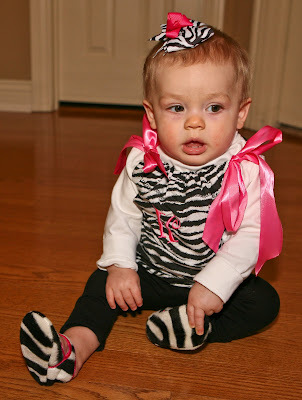 I keep wanting to ask - Where do you get Harper's adorable zebra print outfits? I LOVE zebra print but can't find anything around here! Kelly, I just want to thank you in all of your busy-ness of being a wonderful mommy to little Harper and getting ready for your trip that you take the time to remember the young children that so need our prayers. I also wanted to thank you for introducing Laurren to your 5,553 dearest and most closest friends. One of your readers made a purchase today and shopped for Laurren and I am so grateful that I was able to notify her family that a small check was on the way. Thank you again and I hope you have a wonderful trip! your prayer request touched us. I love her outfit. she is getting so big. Will be praying for you guys while you are on your trip! I'm so thankful that you created that prayer blog. I've met so many women going through similar journeys and it's been an honor to pray for everyone! So happy that we have 132 praises!! Hope you have a wonderful weekend and a safe trip on Monday! Looking forward to reading your posts next week! Thank you for sharing about Noah. I am going to have my 4th grade class make cards for him first think Monday!! Thank you for all of these wonderful links. I have been praying for answers to what more I can do for the body of Christ during this holiday time and going forward into the new year. This is such a wonderful thing you are doing on your blog and I have such hope for God's work to permeate the internet to connect us all and do good works in His name. Harper is adorable!! Love that dress and those darling shoes!! You always have her looking so cute! wow that is so awesome that so many women have been blessed with the gift of motherhood. I am happy to be on that list! I have this same zebra outfit for my daughter!